Introducing the Storm Motorwerks Billet iDrive Dial. Not just a cover - our Billet iDrive Dial replaces the plastic iDrive knob to bring some quality and class to your interior. 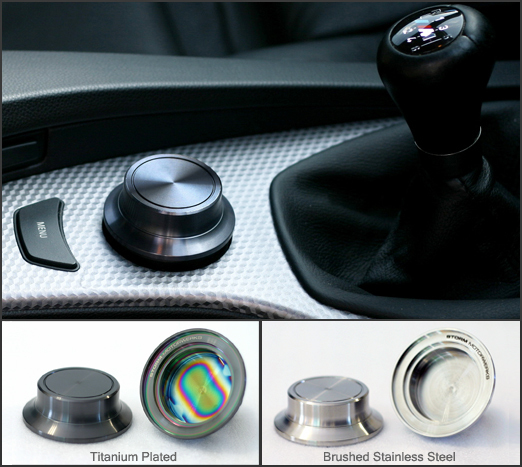 "The billet iDrive knob from Storm makes the original one look like an aftermarket item!" Being a complete replacement for the original item, We have designed the internals to allow our iDrive knob to click into place just like the original - OEM fitment. The original simply unclips upwards using just your fingers and our billet version clips back in - no screws, no glue, no dismantling. An elegant design precision machined for an exact fit. This dial will fit all the iDrive systems which have the large plastic idrive knob - some of these had a leather insert in the top The images below show which iDrive knobs can be replaced with our billet version. We have also shown the connecting base which our version will fit onto. If in doubt just contact us and we will be happy to help. Available in brushed stainless steel and Titanium Plated for a bespoke dark gun metal grey finish. Please choose from the USD options for worldwide shipping or GBP options for UK and EU shipping.